Objective: This study explored whether early pregnancy circadian changes of ambulatory blood pressure monitoring (ABPM) could predict preeclampsia and hypertension. Methods: In a prospective study, 294 pregnant women who were referred to Sarem Women’s Hospital, Iran were recruited. Systolic, diastolic and mean arterial pressures (MAP) were recorded (diurnally and nocturnally) in each trimester. Dipping was defined as a minimum 10% decrease in blood pressure. Results: Of the 251 women who completed the study, 25 percent (n=63) experienced blunted MAP dipping during sleep phases in the second trimester. Eighty-nine percent (n=56) experienced hypertensive disorder in the third trimester, one-third of which experienced preeclampsia. Of the women with normal MAP dipping (n=188), 5 percent (n=10) had gestational hypertension and 1 percent (n=2) became preeclamptic. (P<0.0001). 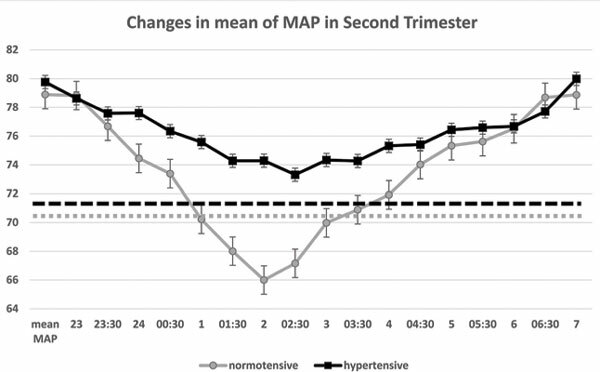 Conclusion: This study clearly demonstrated blunted blood pressure dipping overnight during the second trimester which is a strong predictor of forthcoming pregnancy-induced hypertension and preeclampsia. A scoring system was developed to predict hypertensive disorder and it was significantly correlated with preeclampsia occurrence. Ambulatory blood pressure monitoring, dipping, hypertension, preeclampsia, pregnancy.